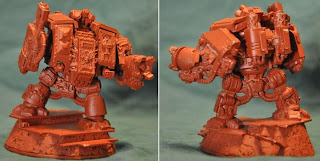 You can see the genesis of many conversions: replacing the bulbs on the backpack with servo-arms, Mega Man arms, Epic Killa Kans on every HQ base, and the tile base. I particualrly enjoy the wrist mounted plasma pistol. It just feels cool to me, but then I'm a big nerd. The flying dread was the most whimsical piece in the army. The idea of getting this beast off the ground is emphasized by the "repulsors" and pipes that look jerry-rigged. I chose the bit as it looked like an up-scaled version of the grav chutes I used as jump repulsors on the Assault Squad. Finally, the cockpit is a popular conversion I learned from the net to get the appearance of a FW dread without the cost: Terminator Torso + Brettonian Head + Upside Down Shoulder Pad. This one always elicits oohs and ahhs. The custom assault cannon was mostly an attempt to bulk it out and could use some tuning up, but I'm satisfied. The joints have been modified to make him appear much more flexible: each arm has been swung outward and each toe has even been reattached a different angle to give the appearance that they are hanging limp during the jump. I added an Epic Killa Kan and a control console to give some context to how high he's jumping. 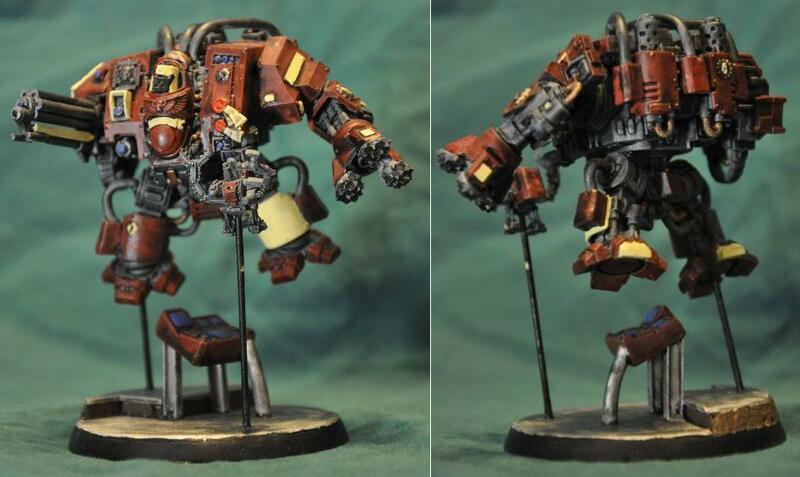 This was begun as a dread I could pod in and forget about, but as I began to model it, he became so much more. On the base of a metal (you read that right, metal) dread, I adjusted leg and arm position to be as dynamic as possible. I only had the abundant 45mm base, so I built a nice little set of stairs for him to run down, intent on making contact, he'd had tank armor jerry-rigged to his chassis: track guards on top, frag grenades up front. The story goes deeper with the sculpted chalice and right leg guard scene. This dread is the last of his chapter: the Flame Wardens. Originally a crusading offshoot of the Imperial Fists, the wardens were injured or aged marines left behind to govern and protect newly cleansed worlds. Their Chapter Master was mortally wounded in the flight from their last home world as a Hive Fleet descended. Having successfully escaped in the armory barge, he was interred in a dreadnought that was inscribed with the symbols of his Chapter. He may not agree with the heretical direction the remnants of the Flame Wardens have taken, but he can't deny the crusading spirit they invoke nor the thud of their munitions against the enemy. Wow, this guy is kind of a disaster. He's got a certain charm often evoked by a toddler whose dressed himself. There's just too much going on that makes no sense at all. If I had it to do over again: no satellite dish, no winch, bu;k out stock missile launcher. The only saving grace of the mini is the supplemental weight pistons in the back. This was a fun conversion and was hard to get right. 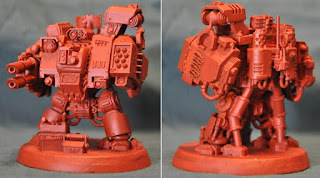 This conversion was completed before the heavy attack dread with assault drill was released, too, and could be converted easily should bitz allow. Very fun squad that could double as an Assault squad without jumps. All chainswords have been converted to vibro-blades a-la Larry Niven's Known Space: Nano-wires encased in a stasis field to make them able to cut through anything. Also, the squad's bolt pistols are represented with auto cannon front ends stuck on their wrists Mega Man style. All characters have Terminator Honors shoulder pads in addition to their AdMech torsos and pad. The poses really help this group. Basically stock veterans come alive in various stances, and head movement shows deliberate purpose. The squad leader seems a little problematic right now. The Thumper he's got in his right hand counts as a Thunder Hammer, but the single LC looks dorky. Maybe a more deliberate punching stance and attack with the Thumper?